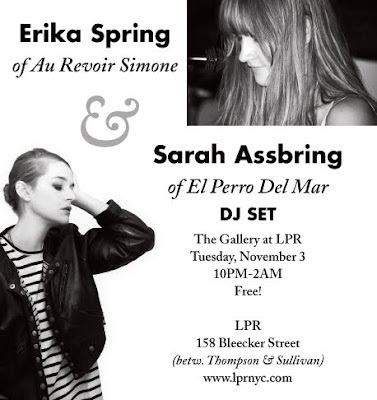 Hey New York, Sarah Assbring of El Perro Del Mar is doing a DJ set TONIGHT, November 3 at Le Poisson Rouge! Swing by and check her out. It's FREE! Erika Spring of Au Revoir Simone will also be doing a DJ set. Did I mention the it's FREE part?! Go, have some fun. Speaking of El Perro Del Mar, check out this video of them covering Lou Reed's "Heavenly Arms." Also, New York area folks, you can also catch El Perro Del Mar supporting Peter Bjorn & John at Webster Hall on November 9.